When adding a dining area to your dream outdoor decor, it's important to have comfortable seating options, to ensure you get to enjoy more time and share more memories with the ones you love. As the perfect compliment piece to your Garden Classic Table, our Amish Poly Mission Counter Side Chairs will do just that! With the available Sunbrella seat cushions and throw pillows, you're sure to have the ability to easily incorporate a comfortable and unique outdoor dining area into any decor! 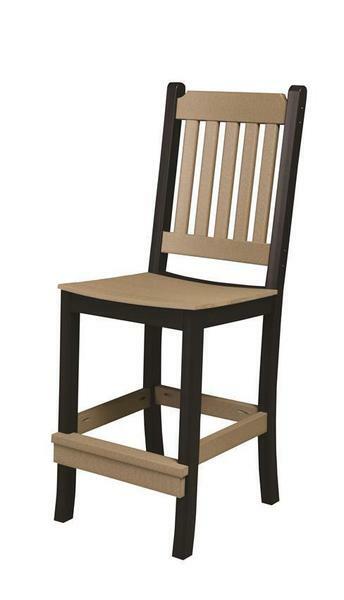 Each chair is handcrafted in the United States, from an environmentally friendly material, known as "Poly Lumber." Composed of 100% recycled milk and detergent jugs, poly lumber is the sustainable alternative for outdoor furniture. Because of the nature of poly lumber, this material will not chip, crack, rot, or develop mold over time. Invest in your dream outdoor retreat with confidence, knowing you're getting furniture that will last decades! Our Mission Counter Side Chair is also available in Dining Height and Bar Height to fit your needs.